5:30 am start with the ebb in heavy showers and flat seas. It is chilly out there. Motoring past many islands and islets in rainy overcast conditions all the way to Goose Bay past the mighty Cape caution feared and revered by all mariners. Today the seas are calm in the Canadian Inside Passage and we only have to put up with swells under a meter as the wind direction and the ebb are aligned. We timed it, got up early and have a very nice passage. When the tides are opposing the winds though, this area is treacherous and huge swells and chop occurs. We are now anchored in Goose Bay, near the mouth of Rivers Inlet in good shelter. 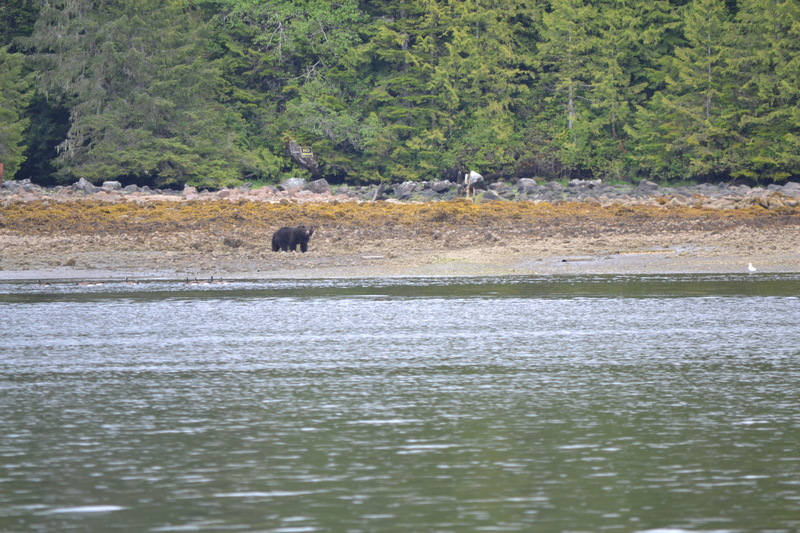 We arrived at low tide past the cannery to see a Grizzly bear, our first sighting of Ursus Horribilis, foraging on the beach. 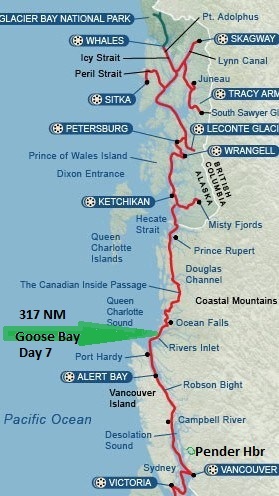 This entry was posted in The Log and tagged Cape Caution, Goose bay, grizzly, Inside passage, Rivers inlet, sailing. Bookmark the permalink.